Block level storage services from physical and virtual SANs are excellent for I/O-intensive and latency-sensitive applications. Most everything else aside from specialized object storage is kept on CIFS (SMB) or NFS file shares. DataCore SANsymphony™ offers a unified storage solution which can present block and file storage services simultaneously from the same platform, or split up the functions on separate centrally-managed nodes. Simultaneously access files and block-level services from a single unified storage services platform. Low-cost licensing options are available for “cheap and deep” storage best suited for aging or relatively inactive data were performance ceases to be a factor. These are sometimes referred to as “bulk storage nodes (BN).” Space saving techniques including deduplication and compression are built in. SANsymphony Bulk nodes can be managed alongside other SANsymphony nodes from the same central DataCore console or as standalone nodes. SANsymphony software enhances NAS services provided by Windows Server such as CIFS, NFS and Scale-out File Server (SoFS) by removing single points of failure in the underlying storage environment. In addition, SANsymphony presents raw block volumes to application servers over Fiber Channel or iSCSI SANs. 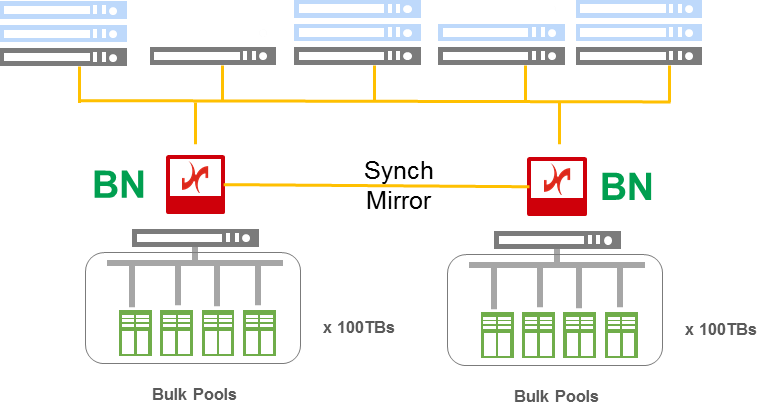 Low-cost SANsymphony Bulk Storage Nodes in a Highly-Available Configuration. Talk with a storage expert to learn how DataCore can provide a highly-available NAS/cluster file share using its unified storage feature.